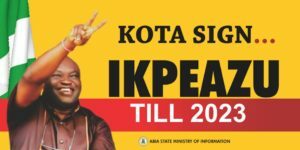 It is a well known that Dr. Okezie Victor Ikpeazu rode on a tripartite crest of equity, justice and fairness to become governor of Abia state. The election of the first Abia governor of Ngwa extraction is undisputedly the most keenly contested with endless but mind-threatening litigations. 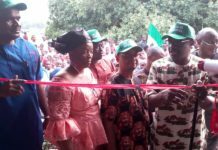 The ruling Peoples Democratic Party (PDP) and some progressively-minded stakeholders had argued and backed the zoning of its governorship ticket to Abia south ahead of 2015 general elections. The unified stance of the party was purposefully tailored to promote equity, justice and family hence an Ngwa person from Abia south was protectively billed to clinch the ticket. 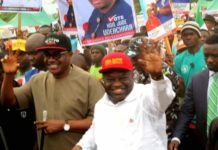 The gubernatorial ticket was later won by Dr. Ikpeazu though not without permutations and high-powered political intrigues. 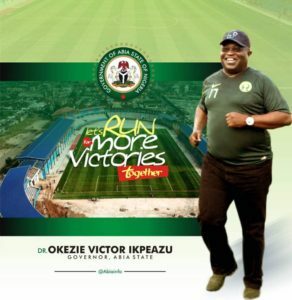 It also took the uncommon resilience of Ukwa-Ngwa people who as a matter of urgency and necessity tagged Dr. Ikpeazu/PDP gubernatorial ticket “Ngwa Project” to narrowly defeat Dr. Alex Otti, of the All Progressives Grand Alliance(APGA) who unexpectedly showed enormous strength, sweeping the entire LGAs in Abia north, Aba north and south LGAs as well as Umuahia south and Ikwuano Umuahia LGAs. The people of Ukwa-Ngwa demonstrated a rare courage and consensus painstakingly exemplified and displayed in the well organized resilience to break the age-long ‘political marginalization’ and ensured the realization of Dr. Ikpeazu’s governorship. Upon taking over the mantle of leadership as governor of Abia state, Dr. Ikpeazu began to showcase his qualities especially in the areas of governance and political leadership. The ongoing infrastructural transformation in Aba and other parts of the state, the economic and entrepreneurial revolution, the sponsored campaign aimed at promoting locally made-in-Aba products, the revival of moribund and ailing state owned industries, the ongoing revolutionized agricultural scheme, the human capacity development programmes such as Education for Employment(E4E) and the ongoing transformation in the education sector are presently showing signs of greatness as a new era evolves under Dr. Ikpeazu. Though still engulfed with threatening litigation’s, Dr. Ikpeazu has sufficiently proven his capacity to take Abia to higher heights. Beyond infrastructural and socio-economic accomplishments, Dr. Ikpeazu also appears ready and willing to demonstrate a rare political will and courage to entrench a new democratic culture in the state. This is evidently portrayed in the ongoing preparations for local government election in less than two years he assumed office. The last council election took place in Abia eight years precisely in 2008. The immediate past governor, Chief Theodore Orji for whatever reason(s) delayed reconstituting the councils democratically and ingloriously exited without conducting another council election. Under his administration, the 17 local government areas were balkanized and regrettably reduced to non-productive entities. The former governor conspired with his family and close allies to hijack the councils. They criminally diverted allocations running into several billions and overpopulated the workforce with unproductive elements mostly drawn ‘Ibeku clan’ without recourse to due process and administrative procedure. 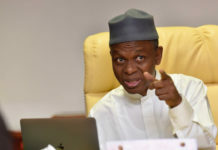 They mismanaged and corruptly destroyed the councils as they stirringly dished out orders and directives from the comfort of their cozy offices in Umuahia to the so-called TC chairmen who were merely stooges and administrative robots. By so doing, Ochendo and his ‘men’ crippled the 17 council areas and pitiably rendered them unproductive. However, Dr. Ikpeazu’s plans to conduct council election appears to have elicited fresh hope for possible revival of the councils. Yet, there are still posers. 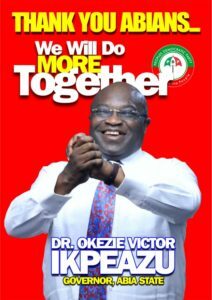 Many Abians still doubt if Dr. Ikpeazu can ever muster the ‘political will’ and ‘sincerity’ to achieve the onerous task. Many are still clutched to the notion that Dr. Ikpeazu is and remains part of the system that decimated and destroyed the local government system in Abia. Those upholding such belief may be 50% right and probably 50% wrong. 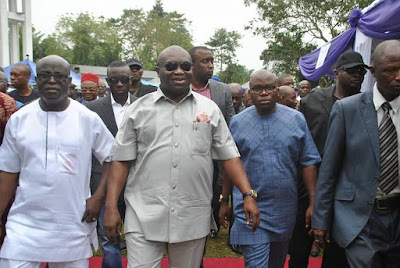 This may be largely substantiated as Dr. Ikpeazu was Ochendo’s ardent loyalist and one of his son’s dreaded foot soldiers who paraded themselves as eleven wise men. Dr. Ikpeazu enjoyed a privileged status in Ochendo’s government and was deeply knowledgeable to most salient actions of that very government. This is ultimately the reason his government is largely perceived as a product or extension of Ochendo’s era hence his emergence as the PDP candidate was politically midwifed by the former governor and his son, Chinedu also known as Ikuku. On the other hand, the proponent of that notion may be wrong as Dr. Ikpeazu may have ‘disguised loyalty’ or ‘played the fool’ to grab power. A political interpretation to Dr. Ikpeazu’s ‘good man role’ and loyalty to Ochendo and his son dramatizes that simple adage that says” If you bend down, you see Aba”. Dr. Ikpeazu’s roles in Ochendo’s government can hardly be interpreted to portray, brand or suggestive of Ochendo’s elongated era. Though he remains grateful to the former governor, his son, Ikuku and other allied power players from Umuahia, the governor is, however, constitutionally empowered to summon the needed political will to redesign approaches to governance and rewrite the wrongs in the state. While preparations for the council election intensify, many expect Dr. Ikpeazu to assume certain steps aimed at sanitizing the system and to dismantle Ochendo’s undemocratic template entrenched and promoted for self-aggrandizement. He is also expected to remove all impediments that may further destroy democracy at the local government level. In clear terms, there will be guided limit to which the state or governor tampers with council allocations. 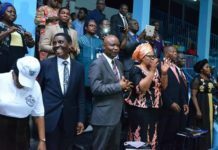 If not so, the scenario may be catastrophic as the incoming council chairman, elected by the people, may within their constitutional powers dismantle obstacles and encumbrances that may inhibit their performances. Dr. Ikpeazu’s political future may be jeopardized or shattered if that becomes the scenario. Therefore, Dr. Ikpeazu should begin to rehearse and possibly acquaint himself with the right democratic culture and administrative pattern to harmoniously and purposefully relate with the incoming council chairmen. He should realize that the 17 council areas will against the unconstitutional practice begin to run fully on their individual strengths and administrative wheels immediately the chairmen and councillors are sworn into offices. The inglorious era of diversion of council funds and criminal mortgage of their revenue nets will automatically cease for good. The chairmen expectedly will run the councils by prudently deploying accruable resources to provide basic and infrastructural needs of the rural dwellers. They must be given freehand to deliver on their campaign promises within their two-year tenure. But, can Dr. Ikpeazu yield to this reform? Can he change the bad story? Can the councils run independently under him? Has Dr. Ikpeazu upon assumption of duty demonstrated the much expected political will suggesting a radical departure from Ochendo’s days? Are Abians likely to experience a credible council election that will provide a level playing ground to all political parties? 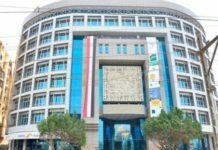 Is the governor ready to release council allocations as drawn from the federation account? Is he ready to change the bad story Abia councils with regard to hijacked revenue nets? 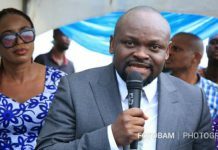 Is he ready to sanitize the evidently corrupt ministry of Local Government and Chieftaincy Affairs by moderating its overbearing influence and control on council areas? Or, is the election a mere exercise aimed at re-packaging the transition committee system under the pretenses of democracy? 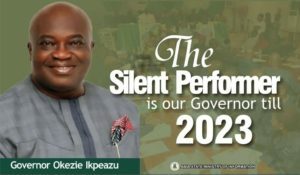 Is Dr. Ikpeazu sincerely entrenching a new democratic culture in the third tier of government of Abia state? Is the governor truly sincere to the people? Does he posses the political will to do the right thing including offending Ochendo and Ikuku, his son, when it becomes necessary to satisfy Abia people? Well, only Dr. Okezie Ikpeazu and time will answer these nagging and pertinent questions. But suffice to say that the governor has two options staring at his face. The option of continuing with the old style and secondly, dismantling the old, unproductive and corrupt system to free the local government councils in the overall interest of Abia people. The governor should patriotically champion the redemption and ultimate freedom of these areas from the administrative hostage of the state with utmost sincerity and honesty to further endear himself to the people. This should begin with free, fair and acceptable council election scheduled for December 17. Dr. Ikpeazu should appease Abians with good governance and utmost sincerity in his official dealings as governor. It will be more charitable and politically rewarding as the governor migrates to the side of the people than remain in the good book of his political ‘godfathers’. He should demonstrate the political will and sincerity in leadership by rewriting the wrongs in the administration of local government in the state. Ebere Uzoukwa, a media consultant and public relations consultant writes from Umuahia.